We had two duck breasts left over from dinner another night, so I kept them cold in the fridge in a bowl, and then decided to toss together this noodle ‘salad’ (the salad part is mainly to make me feel better). I haven’t been much of a fan of egg noodles ever since moving on to rice noodles, wheat noodles, even sweet potato noodles, but the duck is strong enough in flavour to handle the relative heaviness of the egg noodles. 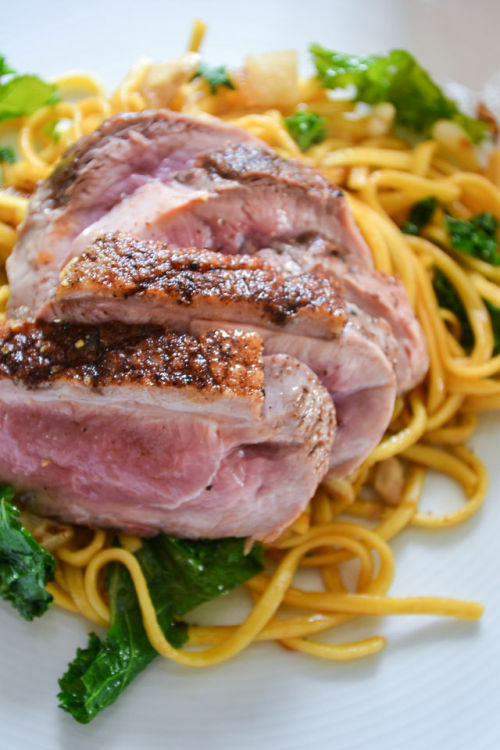 It’s really pretty quick and easy to just toss together, and since you could do the same as I and pre-cook the duck, you can save this for a moment when you don’t have much time to spare! Serves 2-3 as a heavy main, or 4 as a light(er) dinner. Heat up a griddle pan with some oil in it. Pan fry the duck breasts for about 4-5 minutes on each side, then remove from heat. This will make them quite rare, so cook for longer if prefer them less so. Keep them on the side, cooling down, before cutting them into quite thin slices. In the meantime, cook the noodles per the packet–usually a few minutes in boiling water. When ready, drain the water out, and drizzle some sesame oil over them to keep them from sticking. Coarsely chop the nuts. Heat up a wok, with some sesame oil. Fry the shallots lightly, letting them soften, but not quite to the stage where they are browned and caramelised. Then add the mooli, and let it continue to fry on low heat. Add the kale, and continue to stir. Turn up to medium heat. After a minute or so, add the egg noodles, and mix together. Add the oyster sauce, and mix again. Add a dash of (light) soy sauce if you wish, and take off the heat. Sprinkle the cashew nuts over the noodle mixture. 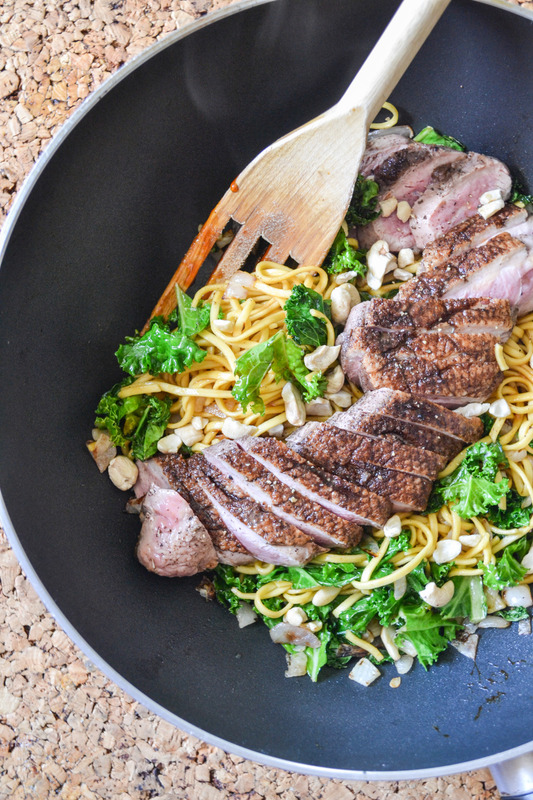 To serve, simply layer the duck breast slices over the noodles in the wok. Enjoy!